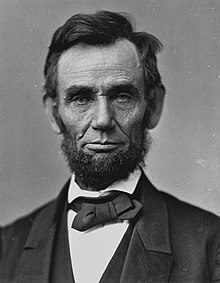 Abraham Lincoln (February 12, 1809 – April 15, 1865) was an American lawyer and politician who served as the 16th president of the United States from 1861 until his assassination in April 1865. Lincoln led the nation through the Civil War, its bloodiest war and its greatest moral, constitutional, and political crisis. He preserved the Union, abolished slavery, strengthened the federal government, and modernized the U.S. economy. Born in Kentucky, Lincoln grew up on the frontier in a poor family. Self-educated, he became a lawyer, Whig Party leader, state legislator and Congressman. He left government to resume his law practice, but angered by the success of Democrats in opening the prairie lands to slavery, reentered politics in 1854. He became a leader in the new Republican Party and gained national attention in 1858 for debating and losing to national Democratic leader Stephen A. Douglas in a Senate campaign. He then ran for President in 1860, sweeping the North and winning. Abraham Lincoln (February 12, 1809 – April 15, 1865) was an American lawyer and politician who served as the 16th president of the United States from 1861 until his assassination in April 1865. Lincoln led the nation through the Civil War, its bloodiest war and its greatest moral, constitutional, and political crisis. He preserved the Union, abolished slavery, strengthened the federal government, and modernized the U.S. economy. Born in Kentucky, Lincoln grew up on the frontier in a poor family. Self-educated, he became a lawyer, Whig Party leader, state legislator and Congressman. He left government to resume his law practice, but angered by the success of Democrats in opening the prairie lands to slavery, reentered politics in 1854. He became a leader in the new Republican Party and gained national attention in 1858 for debating and losing to national Democratic leader Stephen A. Douglas in a Senate campaign. He then ran for President in 1860, sweeping the North and winning. Southern pro-slavery elements took his win as proof that the North was rejecting the Constitutional rights of Southern states to practice slavery. They began the process of seceding from the union. To secure its independence, the new Confederate States of America fired on Fort Sumter, one of the few U.S. forts in the South. Lincoln called up volunteers and militia to suppress the rebellion and restore the Union. 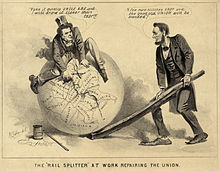 As the leader of the moderate faction of the Republican Party, Lincoln confronted Radical Republicans, who demanded harsher treatment of the South; War Democrats, who rallied a large faction of former opponents into his camp; anti-war Democrats (called Copperheads), who despised him; and irreconcilable secessionists, who plotted his assassination. Lincoln fought the factions by pitting them against each other, by carefully distributing political patronage, and by appealing to the American people. 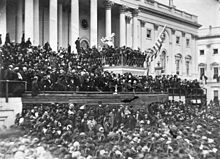 :65–87 His Gettysburg Address became an iconic call for nationalism, republicanism, equal rights, liberty, and democracy. He suspended habeas corpus, and he averted British intervention by defusing the Trent Affair. 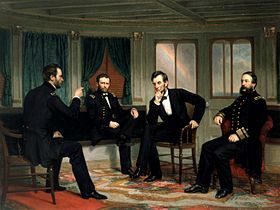 Lincoln closely supervised the war effort, including the selection of generals and the naval blockade that shut down the South's trade. 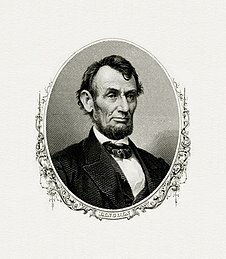 As the war progressed, he maneuvered to end slavery, issuing the Emancipation Proclamation of 1863; ordering the Army to protect escaped slaves, encouraging border states to outlaw slavery, and pushing through Congress the Thirteenth Amendment to the United States Constitution, which outlawed slavery across the country. Lincoln managed his own re-election campaign. He sought to reconcile his damaged nation by avoiding retribution against the secessionists. A few days after the war's end at the Battle of Appomattox Court House, he was assassinated by John Wilkes Booth, an actor and Confederate sympathizer, on April 14, 1865. Abraham Lincoln is remembered as the United States' martyr hero. He is consistently ranked both by scholars and the public as among the greatest U.S. presidents. Lincoln depicted protecting a Native American from his own men in a scene often related about Lincoln's service during the Black Hawk War. Apprehension seems to exist among the people of the Southern States that by the accession of a Republican Administration their property and their peace and personal security are to be endangered. There has never been any reasonable cause for such apprehension. Indeed, the most ample evidence to the contrary has all the while existed and been opnen to their inspection. It is found in nearly all the published speeches of him who now addresses you. I do but quote from one of those speeches when I declare that "I have no purpose, directly or indirectly, to interfere with the institution of slavery in the States where it exists. I believe I have no lawful right to do so, and I have no inclination to do so." "In his company, I was never reminded of my humble origin, or of my unpopular color". Lincoln's image carved into the stone of Mount Rushmore. 1 2 Discharged from command-rank of Captain and re-enlisted at rank of Private. ↑ William A. Pencak (2009). Encyclopedia of the Veteran in America. ABC-CLIO. p. 222. ISBN 978-0-313-08759-2. Retrieved June 27, 2015. ↑ Finkelman, Paul; Gottlieb, Stephen E. Toward a Usable Past: Liberty Under State Constitutions. U of Georgia Press. p. 388. 1 2 3 Randall, James Garfield (1962). Lincoln: The Liberal Statesman. Dodd, Mead. ASIN B0051VUQXO. 1 2 Lindgren, James (November 16, 2000). "Ranking Our Presidents for dealing with the American Civil War, and slavery" (PDF). International World History Project. Archived from the original (PDF) on January 31, 2012. 1 2 "Americans Say Reagan Is the Greatest U.S. President". Gallup.com. February 28, 2011. Archived from the original on March 14, 2012. Retrieved 2019-02-13. 1 2 3 4 5 6 7 8 9 10 11 12 13 14 15 16 17 18 19 20 21 22 23 24 25 26 27 28 29 30 31 32 33 34 35 36 37 38 39 40 41 42 43 44 45 46 47 48 49 50 51 52 53 54 55 56 57 58 59 60 61 62 63 64 65 66 67 68 69 70 71 72 73 74 75 76 77 78 79 80 81 82 83 84 85 86 87 88 89 90 91 92 93 94 95 96 97 98 99 100 101 102 103 104 105 106 Donald, David Herbert (1996-11-05). Lincoln. Simon and Schuster. ISBN 9780684825359. 1 2 3 4 5 6 7 8 9 Warren, Louis A. (2017-10-21). Lincoln's Youth: Indiana Years, Seven to Twenty-One, 1816-1830 (Classic Reprint). Fb&c Limited. ISBN 9780282908300. ↑ Thomas, born January 1778, would have been 8 at the attack, May 1786. Older sources (e.g. Herndon's Informants use six. ↑ Wilson, Douglas Lawson; Davis, Rodney O.; Wilson, Terry; Herndon, William Henry; Weik, Jesse William (1998). 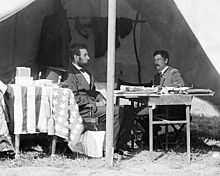 Herndon's Informants: Letters, Interviews, and Statements about Abraham Lincoln. University of Illinois Press. pp. 35–36. ISBN 978-0-252-02328-6. Archived from the original on January 13, 2018. 1 2 Bulla, David W.; Borchard, Gregory A. (2010). Journalism in the Civil War Era. Peter Lang. ISBN 9781433107221. 1 2 3 4 5 6 7 8 9 10 11 12 13 14 15 16 17 18 19 20 21 22 23 24 25 26 27 28 29 30 31 32 33 34 35 White, Ronald C. (2009-01-13). A. Lincoln: A Biography. Random House Publishing Group. ISBN 9781588367754. 1 2 3 4 5 6 7 8 9 10 11 12 Bartelt, William E. (2008). There I Grew Up: Remembering Abraham Lincoln's Indiana Youth. Indiana Historical Society Press. ISBN 9780871952639. 1 2 3 4 5 6 Abraham Lincoln: The Prairie Years. Harcourt, Brace. 1926. OCLC 6579822. ↑ Miller, William Lee (2002-01-01). 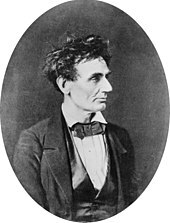 Lincoln's Virtues: An Ethical Biography. Alfred A. Knopf. ISBN 9780375401589. ↑ Madison, James H. (2014). Hoosiers: A New History of Indiana. Indiana University Press. ISBN 9780253013088. 1 2 Oates, Stephen B. (2009-06-30). With Malice Toward None: The Life of Abraham Lincoln. Harper Collins. ISBN 9780061952241. 1 2 3 4 5 6 7 Thomas, Benjamin P. (2008). Abraham Lincoln: A Biography. Southern Illinois University. ISBN 978-0-8093-2887-1. ↑ Gannett, Lewis (Winter 2005). ""Overwhelming Evidence" of a Lincoln-Ann Rutledge Romance? : Reexamining Rutledge Family Reminiscences". Journal of the Abraham Lincoln Association. Springfield, IL: The Abraham Lincoln Association. pp. 28–41. Archived from the original on April 3, 2017. ↑ Lamb, Brian; Swain, Susan, eds. (2008). Abraham Lincoln: Great American Historians on Our Sixteenth President. PublicAffairs. ISBN 978-1-58648-676-1. 1 2 Baker, Jean H. (1989). Mary Todd Lincoln: A Biography. W. W. Norton & Company. ISBN 978-0-393-30586-9. ↑ Jason Emerson (2012). Giant in the Shadows: The Life of Robert T. Lincoln. SIU Press. p. 420. ISBN 978-0-8093-3055-3. Retrieved June 27, 2015. ↑ Shenk, Joshua Wolf (October 2005). "Lincoln's Great Depression". The Atlantic. The Atlantic Monthly Group. Archived from the original on October 20, 2011. Retrieved October 8, 2009. 1 2 Jr, Edward Steers (2010-05-11). 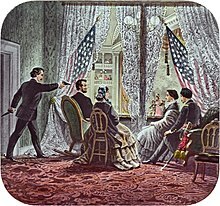 The Lincoln Assassination Encyclopedia. Harper Collins. ISBN 978-0-06-178775-1. ↑ 1943-, Foner, Eric (1970). Free soil, free labor, free men : the ideology of the Republican Party before the Civil War. Oxford University Press. OCLC 1066794386. ↑ Olver, Lynne. "The Food Timeline—Presidents food favorites". foodtimeline.org. Archived from the original on February 4, 2016. Retrieved February 12, 2016. ↑ Kenneth J. Winkle (2001). The Young Eagle: The Rise of Abraham Lincoln. Taylor. pp. 72–79. ISBN 978-1-4617-3436-9. Retrieved June 27, 2015. 1 2 Winkle, Kenneth J. (2001-04-01). The Young Eagle: The Rise of Abraham Lincoln. Taylor Trade Publishing. ISBN 9781461734369. 1 2 Simon, Paul (1990). Lincoln's Preparation for Greatness: The Legislative Years. University of Illinois Press. ISBN 978-0-252-00203-8. ↑ Weik, Jesse William. "Abraham Lincoln and Internal Improvements". Abraham Lincoln's Classroom. Archived from the original on February 12, 2015. Retrieved February 12, 2015. 1 2 3 4 "The Fiery Trial: Abraham Lincoln and American Slavery". doi:10.1163/2468-1733_shafr_sim040100206. 1 2 3 4 5 6 Boritt, G. S. (1994). Lincoln and the Economics of the American Dream. University of Illinois Press. ISBN 9780252064456. 1 2 3 4 5 6 Oates, Stephen B. (1974). 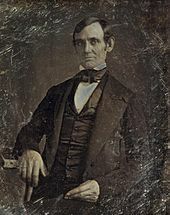 "Abraham Lincoln 1861–1865". In Woodward, Comer Vann. Responses of the Presidents to Charges of Misconduct. New York City: Dell Publishing Company. pp. 111–123. ISBN 978-0-440-05923-3. 1 2 3 4 Harris, William Charles (2007). Lincoln's Rise to the Presidency. University Press of Kansas. ISBN 9780700615209. 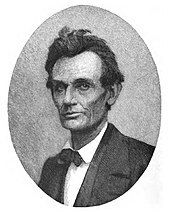 ↑ "US Congressman Lincoln – Abraham Lincoln Historical Society". 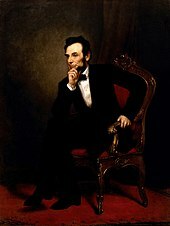 Abraham-lincoln-history.org. Retrieved 2019-02-02. ↑ Heidler, David Stephen; Heidler, Jeanne T. (2006). The Mexican War. Greenwood Publishing Group. ISBN 9780313327926. ↑ "Lincoln's Spot Resolution". National Archives Building, RG 233, Entry 362: Thirtieth Congress, 1847–1849, Records of Legislative Proceedings, Bills and Resolutions Originating in the House, 1847–1849. US House of Representatives: History, Art & Archives. December 22, 1847. Retrieved 2019-02-13. 1 2 3 Holzer, Harold (2004). 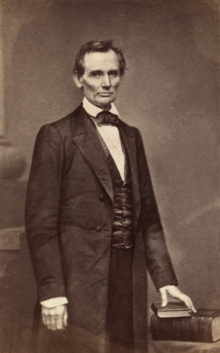 Lincoln at Cooper Union: The Speech That Made Abraham Lincoln President. Simon & Schuster. ISBN 978-0-7432-9964-0. 1 2 3 4 5 Lincoln, Abraham (2008-10-01). The Collected Works of Abraham Lincoln. Wildside Press LLC. ISBN 9781434477071. ↑ Gerleman, David J. (Winter 2017). "Representative Lincoln at Work: Reconstructing a Legislative Career from Original Archival Documents". The Capitol Dome. 54 (2): 33–46. 1 2 McGovern, George S. (2009). Abraham Lincoln: The American Presidents Series: The 16th President, 1861-1865. Henry Holt and Company. ISBN 9780805083453. ↑ "Lincoln's Spot Resolutions". National Archives. Archived from the original on October 20, 2011. Retrieved March 12, 2009. ↑ Arnold, Isaac Newton (1885). The Life of Abraham Lincoln. 2. Chicago, IL: Janses, McClurg, & Company. p. 81. Archived from the original on April 3, 2017. ↑ Pfeiffer, David A. (Summer 2004). "Bridging the Mississippi". Prologue Magazine. Vol. 36 no. 4. Archived from the original on September 23, 2008. Retrieved 2019-02-13 – via National Archives. ↑ McGinty, Brian (2015-02-09). Lincoln's Greatest Case: The River, the Bridge, and the Making of America. W. W. Norton & Company. ISBN 9780871407856. ↑ "Abraham Lincoln's Patent Model: Improvement for Buoying Vessels Over Shoals". Smithsonian Institution. Archived from the original on August 25, 2017. Retrieved April 28, 2017. ↑ Dirck, Brian R. (2007). Lincoln Emancipated: The President and the Politics of Race. Northern Illinois University Press. ISBN 978-0-87580-359-3. ↑ Richards, John T. (2015-07-12). Abraham Lincoln: The Lawyer-Statesman (Classic Reprint). Fb&c Limited. ISBN 9781331281580. ↑ Library, Philosophical (2010-11-09). The Wisdom of Abraham Lincoln. Open Road Media. ISBN 978-1-4532-0281-4. ↑ Harrison, J. Houston (1935). Settlers by the Long Grey Trail. J.K. Reubush. OCLC 3512772. ↑ Zarefsky, David (June 1993). Lincoln, Douglas, and Slavery: In the Crucible of Public Debate. University of Chicago Press. ISBN 978-0-226-97876-5. 1 2 3 4 Jaffa, Harry V. (2000). A New Birth of Freedom: Abraham Lincoln and the Coming of the Civil War. Rowman & Littlefield. ISBN 9780847699520. 1 2 McPherson, James M. (2005-09-29). Battle Cry of Freedom: The Civil War Era. OUP USA. ISBN 9780195168952. 1 2 3 4 5 6 7 Carwardine, Richard (2003). Lincoln. Pearson/Longman. ISBN 9780582032798. 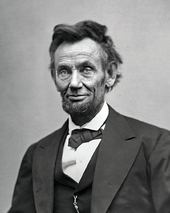 ↑ Lincoln, Abraham (December 20, 1859). "Herewith is a little sketch, as you requested" (Letter). Letter to Jesse W. Fell. Archived from the original on November 7, 2017. Retrieved November 6, 2017. ↑ Luthin, Reinhard H. (July 1944). "Abraham Lincoln and the Tariff". The American Historical Review. 49 (4): 609–629. doi:10.2307/1850218. JSTOR 1850218. ↑ Hofstadter, Richard (October 1938). "The Tariff Issue on the Eve of the Civil War". The American Historical Review. 44 (1): 50–55. doi:10.2307/1840850. JSTOR 1840850. ↑ J. Michael Martinez (2011). Coming for to Carry Me Home: Race in America from Abolitionism to Jim Crow. p. 59. ISBN 978-1-4422-1500-9. Archived from the original on January 13, 2018. ↑ Chadwick, Bruce (2009). Lincoln for President: An Unlikely Candidate, An Audacious Strategy, and the Victory No One Saw Coming. Naperville, Illinois: Sourcebooks. pp. 147–149. ISBN 978-1-4022-4756-9. Archived from the original on April 2, 2017. Retrieved April 1, 2017. ↑ Murrin, John. Liberty, Equality, Power: A History of the American People. Belmont: Clark Baxter, 2006. ↑ Mansch, Larry D. (2005). 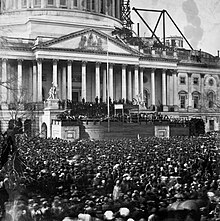 Abraham Lincoln, President-elect: The Four Critical Months from Election to Inauguration. McFarland. ISBN 9780786420261. 1 2 3 4 5 6 7 Nevins, Allan (1950). The Emergence of Lincoln: Prologue to Civil War, 1859-1861. Scribner. ISBN 9780684104164. ↑ Edgar, Walter B. (1998). South Carolina: A History. Univ of South Carolina Press. ISBN 9781570032554. 1 2 Potter, David M. (1977-03-15). The Impending Crisis: America Before the Civil War, 1848-1861. Harper Collins. ISBN 9780061319297. ↑ Vorenberg, Michael (2001-05-21). Final Freedom: The Civil War, the Abolition of Slavery, and the Thirteenth Amendment. Cambridge University Press. ISBN 978-0-521-65267-4. 1 2 Vile, John R. (2003). Encyclopedia of Constitutional Amendments, Proposed Amendments, and Amending Issues, 1789-2002. ABC-CLIO. ISBN 9781851094288. ↑ Lupton, John A. (September–October 2006). 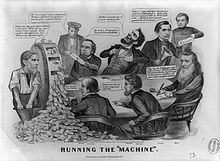 "Abraham Lincoln and the Corwin Amendment". Illinois Heritage. 9 (5): 34. Archived from the original on August 24, 2016. ↑ Sandburg, Carl (November 2002). Abraham Lincoln: The Prairie Years and the War Years. Houghton Mifflin Harcourt. ISBN 978-0-15-602752-6. ↑ Nevins, Allan (1959). The War for the Union. Scribner. ↑ Sherman, William T. (1990). Memoirs of General W.T. Sherman. BiblioBazaar. ISBN 978-1-174-63172-6. ↑ Heidler, David Stephen; Heidler, Jeanne T.; Coles, David J., eds. (2002). Encyclopedia of the American Civil War: A Political, Social, and Military History. W.W. Norton. ISBN 9780393047585. ↑ Neely, Mark E. (1992). The Fate of Liberty: Abraham Lincoln and Civil Liberties. Oxford University Press. pp. 3–31. ↑ Randall, James Garfield (1946). Lincoln the President: Springfield to Gettysburg. p. 50. ISBN 978-0-306-80754-1. Archived from the original on November 22, 2016. Retrieved May 16, 2016. quoted in Kevin Peraino, Lincoln in the World: The Making of a Statesman and the Dawn of American Power (2013) pp 160–61. ↑ Thomas, Benjamin Platt; Hyman, Harold Melvin (1962). Stanton: The Life and Times of Lincoln's Secretary of War. Alfred A. Knopf. pp. 71, 87, 229–30, 385 (quote). ↑ Ambrose, Stephen E. (April 1996). Halleck: Lincoln's Chief of Staff. LSU Press. ISBN 9780807155394. ↑ "Henry W. Halleck". American Battlefield Trust. June 15, 2011. 1 2 3 Goodwin, Doris Kearns (2005-10-25). Team of Rivals: The Political Genius of Abraham Lincoln. Simon and Schuster. ISBN 9780684824901. ↑ Mackubin, Thomas Owens (March 25, 2004). "The Liberator". National Review. Archived from the original on October 20, 2011. Retrieved December 12, 2008. 1 2 Guelzo, Allen C. (1999). Abraham Lincoln: Redeemer President. W.B. Eerdmans Publishing Company. ISBN 9780802838728. ↑ McPherson, James M. (1992-06-04). Abraham Lincoln and the Second American Revolution. Oxford University Press, USA. ISBN 9780195076066. ↑ Guelzo, Allen C.; Guelzo, Director of the Civil War Era Studies Program Allen C. (2004). 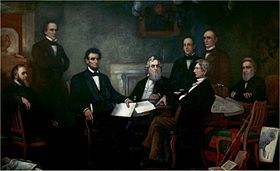 Lincoln's Emancipation Proclamation: The End of Slavery in America. Simon and Schuster. ISBN 9780743221825. ↑ Wills, Garry (2012-12-11). Lincoln at Gettysburg: The Words that Remade America. Simon and Schuster. ISBN 9781439126455. ↑ McPherson, James M.; McPherson, George Henry Davis 86 Professor of American History James M. (2009). Abraham Lincoln. Oxford University Press, USA. ISBN 9780195374520. ↑ "The Peacemakers". The White House Historical Association. Archived from the original on October 20, 2011. Retrieved May 3, 2009. ↑ Neely Jr., Mark E. (December 2004). "Was the Civil War a Total War?". Civil War History. 50 (4): 434–458. doi:10.1353/cwh.2004.0073. ↑ Fish, Carl Russell (October 1902). "Lincoln and the Patronage". The American Historical Review. 8 (1): 53–69. doi:10.2307/1832574. JSTOR 1832574. ↑ Tegeder, Vincent G. (June 1948). "Lincoln and the Territorial Patronage: The Ascendancy of the Radicals in the West". The Mississippi Valley Historical Review. 35 (1): 77–90. doi:10.2307/1895140. JSTOR 1895140. 1 2 Grimsley, Mark; Simpson, Brooks D. (2001). The Collapse of the Confederacy. University of Nebraska Press. ISBN 9780803221703. ↑ Randall, James Garfield; Current, Richard Nelson (1955). Lincoln the President: Last Full Measure. Lincoln the President. IV. Dodd, Mead. 1 2 3 Paludan, Phillip Shaw (1994). The Presidency of Abraham Lincoln. University Press of Kansas. ISBN 978-0-7006-0671-9. ↑ Noll, Mark A.; Noll, Prof Mark A. (2002-10-03). America's God: From Jonathan Edwards to Abraham Lincoln. Oxford University Press, USA. ISBN 9780195151114. ↑ "House passes the 13th Amendment – History.com This Day in History – 1/31/1865". History.com. Archived from the original on November 10, 2012. Retrieved November 19, 2012. ↑ "Primary Documents in American History: 13th Amendment to the U.S. Constitution". Library of Congress. Archived from the original on October 20, 2011. Retrieved October 20, 2011. ↑ Lincove, David A. (2000). Reconstruction in the United States: An Annotated Bibliography. Greenwood. p. 80. ISBN 978-0-313-29199-9. Retrieved June 27, 2015. ↑ Foner, Eric (2010). The Fiery Trial: Abraham Lincoln and American Slavery. W. W. Norton. pp. 334–36. ISBN 978-0-393-34066-2. Retrieved June 27, 2015. 1 2 Donald, David Herbert (2016-03-22). Lincoln Reconsidered: Essays on the Civil War Era. Open Road Media. ISBN 9781504034029. ↑ Summers, Robert. "Abraham Lincoln". Internet Public Library 2 (IPL2). U. Michigan and Drexel U. Archived from the original on October 22, 2011. Retrieved December 9, 2012. ↑ Cox, Hank H. (2005). Lincoln and the Sioux Uprising of 1862. Cumberland House. ISBN 9781581824575. ↑ Schaffer, Jeffrey P. (1999). Yosemite National Park: A Natural History Guide to Yosemite and Its Trails. Berkeley: Wilderness Press. p. 48. ISBN 978-0-89997-244-2. ↑ Blue, Frederick J. (1987). Salmon P. Chase: A Life in Politics. Kent State University Press. ISBN 9780873383400. ↑ "Biographical Directory of Federal Judges". Federal Judicial Center. Archived from the original on July 30, 2016. Retrieved August 11, 2016. ↑ "Federal judges nominated by Abraham Lincoln". BallotPedia. Archived from the original on September 9, 2015. Retrieved August 11, 2016. ↑ Harrison, Lowell (2010-09-12). Lincoln of Kentucky. University Press of Kentucky. ISBN 9780813129402. ↑ Martin, Paul (April 8, 2010). "Lincoln's Missing Bodyguard". Smithsonian Magazine. Archived from the original on October 20, 2011. Retrieved October 15, 2010. ↑ Fox, Richard (2015). Lincoln's Body: A Cultural History. W. W. Norton & Company. ISBN 978-0-393-24724-4. ↑ Abel, E. Lawrence (2015). A Finger in Lincoln's Brain: What Modern Science Reveals about Lincoln, His Assassination, and Its Aftermath. ABC-CLIO. Chapter 14. ↑ "OUR GREAT LOSS; The Assassination of President Lincoln". The New York Times. 1865-04-17. ISSN 0362-4331. Retrieved 2016-04-12. ↑ Donald 1997, pp. 598–599, 686 Witnesses have provided other versions of the quote, i.e. "He now belongs to the ages." and "He is a man for the ages." 1 2 Trostel, Scott D. (2002). The Lincoln Funeral Train: The Final Journey and National Funeral for Abraham Lincoln. Cam-Tech Publishing. ISBN 978-0-925436-21-4. Archived from the original on July 12, 2013. ↑ Goodrich, Th (2005). The Darkest Dawn: Lincoln, Booth, and the Great American Tragedy. Indiana University Press. ISBN 9780253345677. ↑ Peck, Garrett (2015). Walt Whitman in Washington, D.C.: The Civil War and America's Great Poet. Charleston, SC: The History Press. pp. 118–23. ISBN 978-1-62619-973-6. 1 2 3 Martha Hodes (2015). Mourning Lincoln. Yale UP. ISBN 978-0-300-21356-0. Retrieved June 27, 2015. 1 2 3 Wilson, Douglas L. (1999). Honor's Voice: The Transformation of Abraham Lincoln. Random House Digital, Inc. ISBN 978-0-307-76581-9. Retrieved June 27, 2015. ↑ Carwardine, Richard J. (Winter 1997). "Lincoln, Evangelical Religion, and American Political Culture in the Era of the Civil War". Journal of the Abraham Lincoln Association. 18 (1): 27–55. hdl:2027/spo.2629860.0018.104. ↑ On claims that Lincoln was baptized by an associate of Alexander Campbell, see Martin, Jim (1996). "The secret baptism of Abraham Lincoln". Restoration Quarterly. 38 (2). Archived from the original on October 19, 2012. Retrieved May 27, 2012. ↑ Mark A. Noll (1992). A History of Christianity in the United States and Canada. Wm. B. Eerdmans. pp. 321–22. ISBN 978-0-8028-0651-2. Retrieved June 27, 2015. ↑ Brodrecht, Grant R. (2008). "Our Country": Northern Evangelicals and the Union During the Civil War and Reconstruction. University of Notre Dame. ↑ Parrillo, Nicholas (2000). "Lincoln's Calvinist Transformation: Emancipation and War". Civil War History. 46 (3): 227–253. doi:10.1353/cwh.2000.0073. ISSN 1533-6271. 1 2 Verghese, Abraham (May 20, 2009). "Was Lincoln Dying Before He Was Shot?". The Atlantic. Palo Alto, California: Emerson Collective. Archived from the original on April 13, 2014. Retrieved October 8, 2014. ↑ Diggins, John P. (1986-08-15). The Lost Soul of American Politics: Virtue, Self-Interest, and the Foundations of Liberalism. University of Chicago Press. ISBN 9780226148779. ↑ Burton, Orville Vernon (2008-07-08). The Age of Lincoln: A History. Farrar, Straus and Giroux. ISBN 9781429939553. ↑ Belz, Herman (1998). Abraham Lincoln, constitutionalism, and equal rights in the Civil War era. Fordham University Press. ISBN 9780823217687. ↑ Douglass, Frederick (2008). The Life and Times of Frederick Douglass. Cosimo Classics. ISBN 978-1-60520-399-7. ↑ Taranto, James; Leo, Leonard (2004). Presidential Leadership: Rating the Best and the Worst in the White House. Free Press. ISBN 978-0-7432-5433-5. ↑ Densen, John V., ed. (2001). Reassessing The Presidency, The Rise of the Executive State and the Decline of Freedom. Auburn, Alabama: Ludwig von Mises Institute. pp. 1–32. ISBN 978-0945466291. ↑ Ridings, William H.; McIver, Stuart B. (2000). Rating The presidents, A Ranking of U.S. Leaders, From the Great and Honorable to the Dishonest and Incompetent. New York City: Citadel Press. ISBN 978-0806519692. ↑ Chesebrough, David B. (1994). No Sorrow Like Our Sorrow: Northern Protestant Ministers and the Assassination of Lincoln. Kent State University Press. ISBN 9780873384919. ↑ Fornieri, Joseph R.; Gabbard, Sara Vaughn (2008). Lincoln's America: 1809 – 1865. Carbondale, Illinois: SIU Press. p. 19. ISBN 978-0809387137. ↑ Carwardine, Richard; Sexton, Jay, eds. (2011). The Global Lincoln. Oxford, England: Oxford UP. pp. 7, 9–10, 54. ISBN 9780195379112. ↑ Schwartz, Barry; Schwartz, Barry (July 2000). Abraham Lincoln and the Forge of National Memory. University of Chicago Press. ISBN 978-0-226-74197-0. 1 2 3 4 Schwartz, Barry (2008-11-15). Abraham Lincoln in the Post-Heroic Era: History and Memory in Late Twentieth-Century America. University of Chicago Press. ISBN 978-0-226-74188-8. ↑ Havers, Grant N. (2009-11-13). Lincoln and the Politics of Christian Love. University of Missouri Press. p. 96. ISBN 9780826218575. Apart from neo-Confederates such as Mel Bradford who denounced his treatment of the white South. ↑ Belz, Herman (2014-05-20). "Lincoln, Abraham". In Frohnen, Bruce; Beer, Jeremy; Nelson, Jeffrey O. American Conservatism: An Encyclopedia. Open Road Media. ISBN 978-1-932236-43-9. ↑ Graebner, Norman (1959). "Abraham Lincoln: Conservative Statesman". In Basler, Roy Prentice. The enduring Lincoln: Lincoln sesquicentennial lectures at the University of Illinois. University of Illinois Press. ↑ Smith, Robert C. (2010-09-09). Conservatism and Racism, and Why in America They Are the Same. SUNY Press. ISBN 978-1-4384-3233-5. ↑ Zilversmit, Arthur (1980). "Lincoln and the Problem of Race: A Decade of Interpretations". Journal of the Abraham Lincoln Association. Springfield, Illinois: Abraham Lincoln Association. 2 (1): 22–24. ↑ Barr, John M. (Winter 2014). "Holding Up a Flawed Mirror to the American Soul: Abraham Lincoln in the Writings of Lerone Bennett Jr". Journal of the Abraham Lincoln Association. Springfield, Illinois: Abraham Lincoln Association. 35 (1): 43–65. ↑ Bennett, Lerone, Jr. (February 1968). "Was Abe Lincoln a White Supremacist?". Ebony. Vol. 23 no. 4. ISSN 0012-9011. ↑ Dirck, Brian R. (2008-12-12). Lincoln the Lawyer. University of Illinois Press. ISBN 9780252076145. ↑ Striner, Richard (2006-02-12). Father Abraham: Lincoln's relentless struggle to end slavery. Oxford University Press. ISBN 978-0-19-518306-1. ↑ Cashin, Joan E.; Cashin, Associate Professor of History Joan E. (2002-10-06). The War was You and Me: Civilians in the American Civil War. Princeton University Press. ISBN 9780691091747. ↑ Kelley, Robin D. G.; Lewis, Earl (2005-04-28). To Make Our World Anew: Volume I: A History of African Americans to 1880. Oxford University Press. ISBN 9780198040064. ↑ Hirschkorn, Phil (January 17, 2009). "The Obama-Lincoln Parallel: A Closer Look". CBS News. New York City: CBS Corporation. Archived from the original on August 22, 2016. Retrieved January 26, 2017. ↑ Jackson, David (January 10, 2013). "Obama to be sworn in with Lincoln, King Bibles". USA Today. Mclean, Virginia: Gannett Company. Archived from the original on March 24, 2015. Retrieved March 2, 2016. ↑ Hornick, Ed (January 18, 2009). "For Obama, Lincoln was model president". CNN. Atlanta, Georgia: Turner Broadcasting Systems. Retrieved August 5, 2018. ↑ Spielberg, Steven; Kushner, Tony; Kearns Goodwin, Doris (2012). "Mr. Lincoln Goes to Hollywood". Smithsonian. Vol. 43 no. 7. Washington DC: Smithsonian Institution. pp. 46–53. ↑ Stokes, Melvyn, "Abraham Lincoln and the Movies", American Nineteenth Century History 12 (June 2011), pp. 203–31. ↑ Houseman, Donna; Kloetzel, James E.; Snee, Chad (October 2018). Scott Specialized Catalogue of United States Stamps & Covers 2019: Confederate States, Canal Zone, Danish West Indies, Guam, Hawaii, United Nations. Amos Media Company. ISBN 9780894875595. ↑ Dennis, Matthew (2018-07-05). Red, White, and Blue Letter Days: An American Calendar. Cornell University Press. ISBN 9781501723704. ↑ "Nebraska.gov". nebraska.gov. Archived from the original on March 16, 2015. Retrieved March 5, 2015. ↑ "Mount Rushmore National Memorial". U.S. National Park Service. Archived from the original on October 23, 2011. Retrieved November 13, 2010. 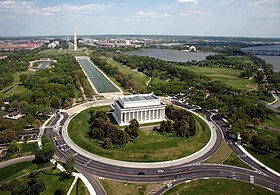 ↑ "The Abraham Lincoln Presidential Library and Museum". Abraham Lincoln Presidential Library and Museum. Archived from the original on October 25, 2011. Retrieved September 23, 2009. ↑ "About Ford's". Ford's Theatre. Archived from the original on October 25, 2011. Retrieved September 23, 2009.